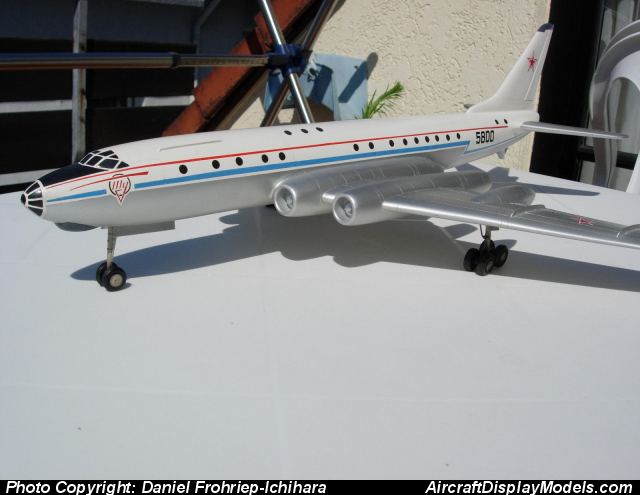 5800 This beautiful and very detailed original hand-made heavy Wood Model has been acquired from famous Alex Panchenko from ussr-airspace in 2003 and was manufactured back in the 60s by Engineers of the Tupolev Design Bureau for the purpose of presentation to customers. The Tu-110 was a major redesign of the Tu-104, powered by four Lyulka AL-7 turbojets rated at 5,500 kgf (53.9 kN; 12,100 lbf) thrust each, with two staggered engines in the root of each extended centresection. The first prototype was flown on 11 March, 1957. Production of the Tu-110 was authorized at the Kazan Aircraft Factory, with an initial order for ten aircraft, but only three aircraft were completed before the program was terminated. The production aircraft featured extended-chord wings and enlarged baggage holds, as well as seating for up to 100 passengers in an all-tourist class seating arrangement. It is now displayed in my small Aviation Museum in Japan.